Should I buy some sort of family medical health insurance? Home / FAQ / Should I buy some sort of family medical health insurance? All of the controversy surrounding the Affordable Health Care for America Act has brought to the forefront of the collective American psyche the question of whether or not it’s important to purchase some sort of family medical health insurance. There are valid arguments on both sides of the issue yet no real clear answers one way or the other. In the end, the choice of purchasing health insurance is an individual one for the time being. That will change in 2014 if the 2009 law is not repealed or changed. You can find health insurance rates online with our free search tool – simply enter your zip code to get started. The closer we get to the full implementation of the Act, the less important the question of family health insurance becomes. That is because if the law is not repealed or changed, every American citizen will be required to purchase some sort of health insurance, be it through an employer or a healthcare exchange. Those who refuse will face a stiff federal penalty, a penalty that will be more expensive than purchasing insurance. How many American families don’t have health insurance? Often we hear that the total number of Americans uninsured is roughly 46 million. That number has become the standard for proponents of universal healthcare because it’s taken from the last U.S. census in 2010. The Centers for Disease Control includes that number in their statistical reporting, furthering the belief that there really are that many Americans without health insurance. However, the number is very misleading because of the information it does not include. Among the missing information is the fact that nearly 15 million referenced in the survey are not U.S. citizens. Also missing from that 46 million figure is the fact the many Americans who can afford insurance but decide not to purchase it. Finally, the number does not take into account individuals and families who are eligible for current government health insurance programs but fail to apply. In such cases, individuals would automatically be enrolled in a government program at their first visit to an emergency room. Are there any legitimate reasons why I should buy family health insurance? From a financial standpoint, the number one reason why you should buy family medical insurance if you can afford it is that without it, the amount of care you can receive will be limited. According to a federal law passed in 1986, and published by the federal government’s National Institutes for Health, no doctor or medical institution can turn you away if you need care for a life-threatening condition. However, that’s where the law stops. You can be turned away for other types of care if you have no means to pay for it. So if you want treatment for your warts, your arthritis, your back issues, etc., you will pay for it out-of-pocket if you don’t have health insurance. From an ethical and moral standpoint, you should purchase health insurance if you can afford it so as not to burden everyone else with the cost of emergency medical services you might receive. Truth be known, if you walk into an emergency room and need emergency medical care, the cost of that care is passed on to other patients in the form of higher prices. 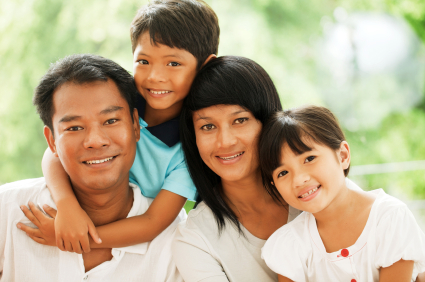 What are my options for buying family health insurance? The most common option for family health insurance policies is to purchase them through employers. In fact, according to census numbers, most families procure health insurance by that method. Unfortunately, it is also one of the more expensive options because of the all-inclusive nature of group policies. In other words, group health insurance generally covers just about everything to make accommodations for every member of the group. Yet, if you are willing to limit the types of coverage you use, you can buy a cheaper insurance policy on the open market. For example, if you and your spouse have decided to have no more children, and have had surgery in order to guarantee that, you no longer need maternity coverage. Removing that can significantly reduce your annual premiums. Furthermore, if you’re willing to pay for routine doctor visits, immunizations, etc. on your own that will further reduce the cost of a family plan. If you buy your own family health insurance plan on the open market, the idea is to pay only for the coverage you know you will need. Anything else can be assessed on a case-by-case basis for its appropriateness to your family. By shopping this way, it’s common to get a family policy for just a couple of hundred dollars a month. Just be advised that pre-existing conditions may not be covered inexpensively, or sometimes even at all, under policies you buy on the open market. Health insurance rates await you online when you enter your zip code in the search tool below. When do I need to buy family health insurance? How long does it take to buy short term medical health insurance?